Mark Messier Trail serves as an important north-south goods movement and commuter corridor connecting Edmonton to the City of St. Albert. In order to prepare for long-term growth, the City of Edmonton has developed a recommended concept plan for Mark Messier Trail from 137 Avenue to Anthony Henday Drive. The plan looks at long-term improvements to the corridor to accommodate traffic growth, assesses multi-modal transportation needs and addresses access requirements for existing and future industrial development. The Mark Messier Trail Planning Study is in the Concept stage of the project lifecycle. It was initiated in fall 2013 and completed in spring 2014. Public participation in the concept planning process helped city planners to understand the current and future transportation needs of this corridor. Stakeholder interviews were conducted in November and December of 2013 and was followed by an open house where information was presented about the project and public feedback was gathered. A final concept plan was then released in March 2014. There is no funding allocated to this project therefore there is no timeline for construction. The recommended concept plan for Mark Messier Trail is now available for review. 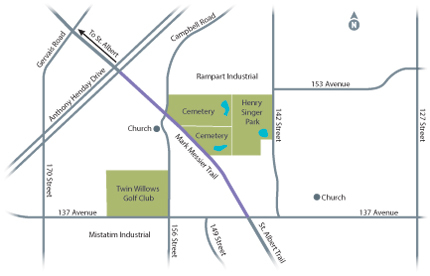 The City of Edmonton held an Open House to present options and gather public input on the concept plan for Mark Messier Trail from 137 Avenue to Anthony Henday Drive. Below is the information that was presented at the Open House.